Dude, where’s my flying car?!? So all I could think when I read this is “Where’s my Jet Pack?”, which is what I thought I’d have by now. The cartoon is actually four frames, so you’ll have to click it for the last frame (and it’ll take you to the site that I got it from. After clicking it, as with all xkcd cartoons, be sure to hover your mouse pointer over it for an extra punchline, while it’s not as funny, it does reference my initial needs. You’ll have to click to see the other four frames of the cartoon. FYI, hovering your mouse over the actual cartoon usually adds a little more to the cartoon’s story (or explains some of the geeky concepts concepts). 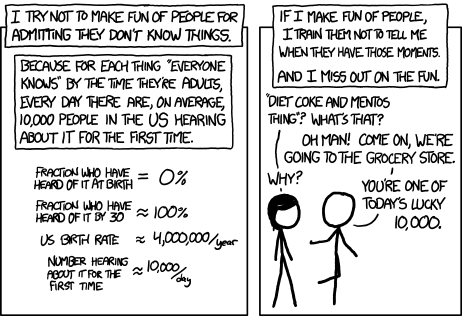 http://GarySaid.com/tags/xkcd/ generated Friday, April 19th 2019 at 2:41:04 pm EDT (in 94 queries in 0.672 seconds).